Patricia Krenwinkel, aka "Katie," played a key part in the infamous Tate-LaBianca murders spearheaded by Charles Manson in 1969. She stabbed Abigail Folger so many times, police thought the coffee heiress' originally white nightgown was bought red when they found her body. She also stabbed Rosemary LaBianca, and wrote "DEATH TO PIGS" on a wall on the LaBiancas' house and "HeaLter SkeLTter" on the LaBiancas' refrigerator. During her murder trial, she doodled Satanic images and, along with her fellow Manson devotees, added to the spectacle by shaving her head and carving an X into her forehead. Krenwinkel has been in jail for about 45 years. Above is an excerpt from Olivia Klaus' short documentary My Life After Manson, which played earlier this year at the Tribeca Film Festival. It is Krenwinkel's first on-camera interview in 20 years. Over the years, I had gotten to know this woman — and our many conversations about life, love and politics had revealed slivers of a dark past. But not until her on-camera interview, featured in this Op-Doc, did I fully comprehend her journey of self-discovery. In prison, she has struggled mightily to reconcile two parts of her life: the 21-year-old girl who committed crimes to win the approval of the man she loved; and the 66-year-old woman who lives each day haunted by the unending suffering she has caused. 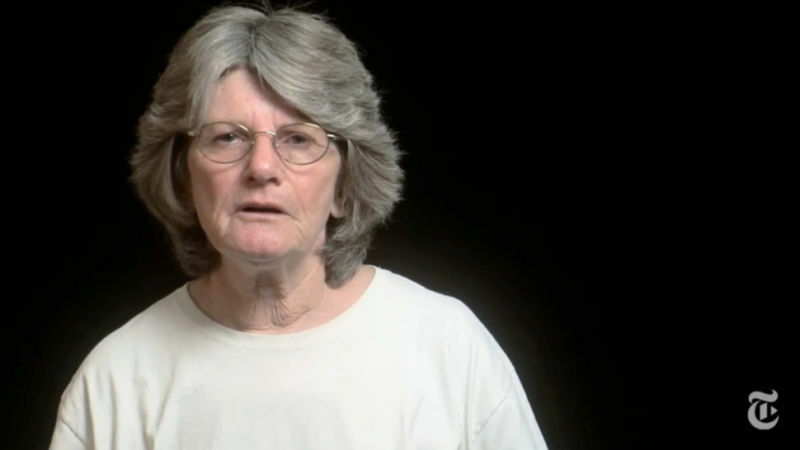 Ms. Krenwinkel is now the longest serving woman in the California prison system. She says she takes full responsibility for her actions — finally, she says, she is a woman she can accept. But is society ready to accept her back? She is next eligible for parole in 2018. It's not unreasonable to view Krenwinkel as someone who deserves to rot in jail for the rest of her life. Her public behavior was beyond heinous. But she is also an old woman who continues to pay the price of really stupid decisions she made when she was a kid, several persons ago. That is how I looked at my life: It is broken beyond repair. But there is something that comes with that little bit that says everyday, 'OK, I did that.' But why did I do that? And it's pulling apart this enmeshed garbage, pulling apart who am I, who is he, where am I in this? And then recreating the person, and there is a freedom in that to finally recreate that today I am who I choose to be. I take responsibility everyday for every word I say, what I believe, what I do. I am who I am today because I have fought desperately for everything that I am. For those beliefs, for what doesn't matter whether my politics, whatever it may be, they're mine now. They're mine because I have weighed them, I have looked at them, and I have listened, but no one tells me that this is what I must take or accept. These are my choices. I learned choice. I learned choice at the most horrific cost.